NovaTick now supports the SIP feeds, confirming that banks and trading firms do not have to compromise speed for coverage or functionalities. NEW YORK, LONDON, PARIS- MAY 15, 2017 – NovaSparks™, the leading field programmable gate array (FPGA) market data company, today announced that it has added the Securities Information Processors (SIP) feeds to its list of supported feeds. The SIP feeds are a critical element of every bank and trading firm’s equity infrastructure. They are consolidated feeds that provide Best-Bid-Offer (BBO) and National-Best-Bid-and-Offer (NBBO) information for all U.S. equity markets, in addition to displaying important regulatory information. 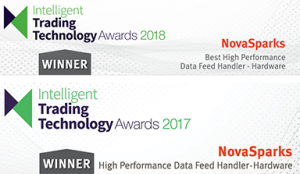 With the addition of the SIP feeds, banks and trading firms can now leverage NovaTick feed handlers to complement their NovaTick direct feed deployment, and to disseminate important regulatory information including the Limit Up/Limit Down (LULD) price bands, short sale restrictions, and regulatory halts. NovaTick feed handlers have the most complete coverage and feature set of any pure hardware solution currently available. NovaTick offers a level of determinism that only an FPGA can deliver, even and especially during market data peaks. NovaTick feed handlers are incredibly fast with 800 nanoseconds of latency, measured wire-to-wire. With NovaTick, investment banks and trading firms now have the complete package at their fingertips: speed, functionality, scalability and coverage. NovaSparks is the leader in FPGA-based high performance and ultra-low latency market data solutions for the financial industry. NovaSparks unique FPGA centric approach delivers sub microsecond processing latency including book building, even during market peak periods. Available for over 50 feeds among the major Equity, Futures and Options venues across North America, Europe and Asia, the feed handlers are packaged in easy-to-deploy appliances offering an extensive fan-out capability for market data distribution. Founded in 2008 and backed by well-established investors, NovaSparks’ offices are located in Paris, France and New York, USA.